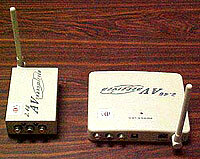 SecureCiti International after years of sourcing and testing on numerous wireless video and audio transmitter we have finally settle for AVS 2.4. 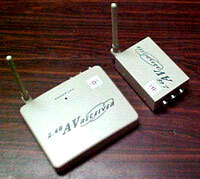 AVS2.4 is a 2.4 GHz wireless Video / Audio transmitter & receiver system. These product is designed to transmit any video and audio source (for example, TV, radio, CD, VCR, DVD, projector, cable or satellite signals) around the house, office, factories etc without the need for drilling holes to lay cables at all. This unit even send crystal clear audio signals. For remote surveillance AVS 2.4 can also be connected with any of our CCTV cameras, convention or miniature to be use as surveillance. If a CCD camera is connected to AVS 2.4 it can be use as a monitoring device to watch your child, elderly, maids & nanny or even to monitor your cars, shop, factories, office and home. 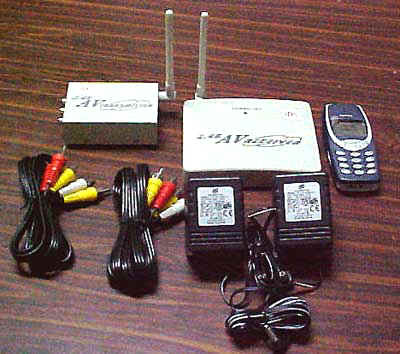 This device can be connected to your existing VCR and TV set to be use as monitoring device. It can also be connected to high end security Time lapse recorder, DVR end even remote monitoring system etc. This wireless receiver and transmitter are useful in situation where laying of video and audio cable is impossible or in covert operation. Furthermore AVS 2.4 operate on Colour and B/W camera with audio. As this product is IDA approved and operate on the approved 2.4Ghz frequency it is 100% legal for use in Singapore, UK and most of Europe. They offer excellent picture quality and approx 150 metres in ideal conditions. When this system is install in building the operating distance is between 50 to 100 metres. They can work to a greater distance. 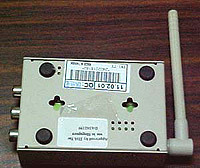 NTSC & PAL system format. Very simple to install relocate and absolutely no laying of cables are needed. Transmit Video and Audio signal for up to 150 meter under ideal condition. AVS 2.4 can even be link to our remote dial-in surveillance system. To purchase the above equipment please call or e-mail to sales@secureciti.com. Our sales personnel will get back to you.